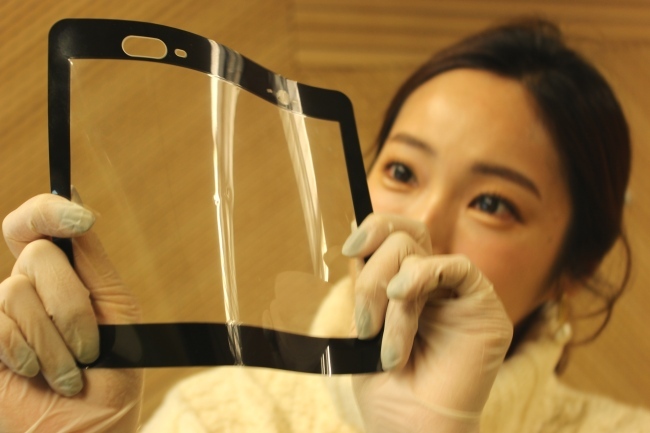 The nation’s energy-to-petrochemical giant SK Innovation will introduce flexible film developed for foldable devices at the Consumer Electronics Show, which kicks off next week in Las Vegas, the company said Tuesday. The transparent film, called Flexible Cover Window, was designed to protect displays and is considered a core component of foldable smartphones for its flexibility as well as its durability. Market interest in the plastic film has been growing alongside plans for the commercialization of foldable devices ranging from smartphones to laptops and tablets. SK Innovation has completed the development of polyimide film for flexible displays, a project it began in 2016, and is currently preparing to commercialize the material, the company said. It plans to build a plant this year and collaborate with local display manufacturers to pursue the development of foldable displays using the film. In the second quarter, the company plans to invest 40 billion won to start commercialization of the product at its manufacturing complex in Jeungpyeong, North Chungcheong Province. It is also reviewing whether to expand the plant to facilitate mass production of the flexible film. Thanks to the hard-coating technology that the company secured while developing the PI film, the product remains unmarked even after being folded tens of thousands of times, the company added. It is also a scratch-resistant product. The company will provide a wide range of solutions that will enable the use of the flexible film in devices, a representative said, explaining that it can manufacture the product with hard- and functional-coating technology. The company said it had secured a competitive edge by developing other electronics-industry materials in addition to the PI film, such as lithium-ion battery separators. SK Innovation is the world’s second-largest supplier of lithium-ion battery separators.